Dried corn snack. But it isn't hard like corn left out over night. It is crisp and airy. 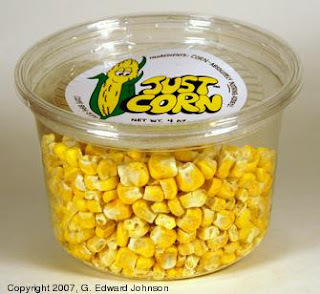 Not only does it still taste like corn, but it tastes like fresh corn (but dry). It is crisp and airy. Pop a handful of it in your mouth and crunch away. This stuff is really good, much better than I expected. Ingredients: Corn, nothing else.